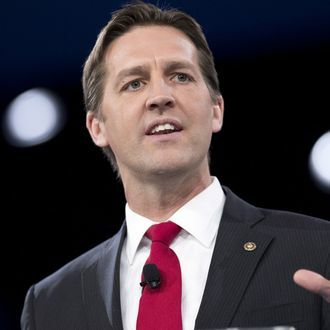 Ben Sasse's plea for a draft candidate to oppose the godless liberal Donald Trump foisted onto regular Americans by Beltway Republicans needs a response from somebody like Senator Ben Sasse! Herewith is my response, as an American, to Senator Ben Sasse’s Facebook post, which he styled as "An Open Letter to Majority America." Thanks for taking the time from your not-so-busy Senate schedule to let us know via Facebook that you share our total disdain for the likely presidential choices that Beltway elements have foisted upon us, and that there’s still hope for what we actually want, which is a right-wing president who forces the squabbling parties in Congress to come together on right-wing policies. Here in California we will have lots of choices in November, including the nominees of the Libertarian, Green, American Independent, and Peace and Freedom parties. Maybe there are no ballot lines in Nebraska other than the Democrat Socialists or the Republicans; if so, I can understand your frustration. And hey, thanks for being the only politician — or “citizen-politician,” or whatever you call yourself — to understand that our young people are searching for an alternative to the two corrupt liberal parties in Washington but are handicapped by their ignorance of “the meaning of America,” which you quite properly define as fighting terrorists, balancing the budget, and opposing political correctness. If we had better educated these young people, they’d realize we need to get rid of minimum-wage laws so they can earn the money to pay off their student loans instead of expecting Uncle Sugar to let them dodge their obligations. In the meantime, there’s plenty of support out there for the clear path you identify: a “draft” of a candidate who will defy both parties by implementing a simple and totally noncontroversial agenda of more money for national security, less money for those godless entitlements like Social Security and Medicare, abolishing federal involvement in K-12 education, and ending “incumbency protections” like those that made Donald Trump, Ted Cruz, Ben Carson, and Carly Fiorina viable presidential candidates this time around. Who outside of Washington could possibly argue with any of that? Isn’t it obvious “limited government” is the one thing we can all agree on? Indeed, this is all so simple that the only thing I can find to disagree with in your “open letter” is the suggestion that someone like your own self has too many family obligations to accept this “draft.” Won’t the citizens of Fremont, and real “majority Americans” everywhere, lift such a candidate to victory effortlessly? Can’t this “silent majority” come together to “make America great again”? Oh wait.